Booby and the Beast: "Mommy, Are You Dying?" I had chemo this week, on Monday. As usual, I've been in a type of fog all week. My mother-in-law is here visiting, and asked me to describe it. She wanted to understand what I was experiencing, and, by extension, what my father-in-law might have experienced when he was being treated for pancreatic cancer. I struggled for the right words, but came up with this: "I just feel like my head is in the clouds." It's like my thoughts are fluttering types of insects now, buzzing all over the place without ever standing still long enough for me to grab hold of one. As chemo week ends, it gets slightly better, but I'm not sure I fully recover between infusions. And I struggle with how to manage my emotions, how to answer difficult questions, how to be a more present parent. After chemo on Monday, I thought I could take Quinn and my mother-in-law grocery shopping with me, so that Chris could get some work done. And I don't know if Quinn is going through a growth spurt or this is just him being three or me getting chemo, but mid-afternoons have been rough for us lately. Like he needs a nap but the best I can hope for is some downtime in front of the t.v. for an hour. So pumped up on steroids and not yet starting to feel any side effects (I didn't think), I attempted to take my 3-year-old to the grocery store. It was exceptionally crowded at Trader Joe's, and I tried to convince Q to sit in the seat of my cart rather than get his own cart -- those miniature ones that TJ's offers for kids, which are such an adorable idea in theory. But Quinn would not be deterred, and I didn't think I was up for the fight. I told him he could have his own but he had to stay right next to me. He said he would. I can see so many of you with kids already know where this is going. First thing inside, right next to the salads, as I was trying to navigate the limited space between the employee restocking shelves and the elderly couple in front of me, Quinn started ramming his little mini-cart into my ankles. To his credit, he was staying right next to me. "Please stop, buddy," I asked him gently a couple of times. He didn't. My ankles were taking a beating. "Quinn, if you don't stop, you're going to have to sit in my cart," I reminded him, my voice getting more stern as I got more annoyed. I couldn't do it. Not on steroids, not after chemo, not in a crowded store. So I picked him up -- at which point he started screaming and kicking -- and said nevermind, we were going to skip grocery shopping that day. He kicked a shoe off in the parking lot on our way back to the car. A stranger kindly picked it up for us. He refused to sit in his carseat. It was close to 100-degrees outside, and I was out of breath from the walk to the car with a flailing child in my hands. I was also out of patience. He kicked me in the ribs as I tried to wrestle him into his carseat. Nearly HALF AN HOUR went by. He was screaming, I was crying, cars were lining up waiting to pull into my spot as I tried to wave them along. I called Chris, who says I was so hysterical he thought I'd gotten into an accident. And then I growled at Quinn in a voice that sounded (even to my own ears) like I was possessed to GET IN YOUR DAMN CARSEAT. He finally relented. Thank you, chemo and steroids, for making me realize that I can, in fact, growl at this three-year-old (in front of my mother-in-law, no less). This is not the parent I want to be. We both calmed down on the ride home, and we talked about what went wrong. Quinn and I promised each other we'd make the next day better (and we did). This, after my nurses cut my steroid dose in half a couple of sessions ago so that I would have less emotional reactions on my chemo weeks. The flip-side is my chemo side effects are bigger and badder, and I'm pretty certain I still have 'roid rage. I have felt terrible most of this week, because that's what chemo does with less medication to offset it. A doctor I follow on Twitter suggested asking my oncologist about not taking steroids at all, to take the emotional effects out of the equation. Or it could also be that, after seventeen months on this drug, its effects are building up in my system and this is just the way it is. "Mommy, why are you a little bit sad?" I hadn't been feeling a little bit sad, I didn't think. Nostalgic, if anything. "Because you're growing up so fast, and I want to remember all of it," I said and smiled at him. "Well, I'll remember it!" he promised. Then, this zinger: "Mommy, are you dying?" I hugged him tighter so he wouldn't see the tears that immediately came to my eyes, the emotion that made me feel like my chest might crack in two. "Not anytime soon, honey," I told him. "I want to remember when you die," he said. Then, "What does 'dying' mean?" Why did we have to have this conversation at 7:15 on a Friday? "It means when someone's not here with us anymore," I tried. "Oh." He thought for a minute. "But I want you to stay here with me in this house forever!" "I want to, too, buddy. I'll stay as long as I can, okay?" Man, it's been a long week. Here's to easier conversations and fewer side effects and being a more mindful parent in the weeks ahead. Other parents, how do you talk to your toddlers about cancer? How do you manage your side effects with children around? And, finally -- more steroids or less? Tears and hugs. Love you! Love you too, my friend. Sorry to make you cry! Thank you for sharing some of your day with us. My love to you. Thanks for following along, Terry, and for all YOU do to share your story! You're doing great. 7.15 am may be not the best time, but there is no good time for talking to a toddler about mommy's mortality.He feels free to ask and that is good. Has he overheard any conversation with your mother-in-law? Just sending all kinds of love your way. I remember a few of my own mommy meltdowns and feel compelled to remind you that steroids or no steroids, motherhood is damn difficult some days. You are doing a WONDERFUL job. And, as evidenced by your answer to Quinn's "Are you dying?" question, you are doing an amazing job with Quinn in areas that I wish you didn't have to explore with a 3-year old. Thanks for the reminder that parenting is "damn difficult" for all of us sometimes. I need to remember that when I'm having a week like this last one. Lots of love right back to you! I think I would have said the same thing to my son. He is almost five. It this fine line we have to ride between being honest and protecting. I'm not sure if I know how to navigate it. Your post is lovely. 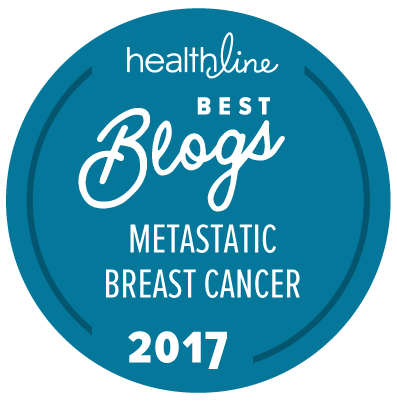 Living with metastatic breast cancer and juggling motherhood is challenging to say the least. The side effect snow ball is hard to balance too. How do you find the right combination to support living the best quality of life possible? I have no answers... Just that I too struggle with very similar issues. Sadly, there are too many of us struggling with these issues. Hang in there, sweet mama. What an amazing mom you are. While I am sure you were in shock with this kind of question from your loving 3 year old, imagine what is going on in his head. he must be really scared to see what is happening with your treatments. Your reaction sounds like my own some days and I have no chemo treatments or anything like that. kids can push all the right buttons to get the reaction and maybe in that moment that is what you both needed- to be pushed to cry together and then talk about it. I pray that your treatments work quickly and that you can work through all these emotions with your son. Thank you for your kind words. And I think you're on to something -- sometimes, it's like my son knows exactly what we both need emotionally and he finds a way to make it happen. I hope we get to keep working through things together for years and years to come. Jennifer -- I'd love to send you a copy of You Are The Best Medicine, a children's picture book I wrote after my own Stage 4 diagnosis. I think it will help you to explain to Quinn how important his love is in helping you to feel better. How can I reach you? You can find me at http:///www.mommymade.com. Thank you for all you do. I would absolutely LOVE a copy of your book. I've been thinking I need a more child-focused way to talk to him about my doctors appointments, fatigue, prior hair loss, etc, without scaring him or making him feel somehow responsible. I'll be in touch soon. Thank you!! This is incredibly touching .I LOVE it. He is a very astute little boy. Love YOU!